I'd heard a lot about this book and was really looking forward to reading it! I didn't know about all the illustrations, so that was a lovely surprise. 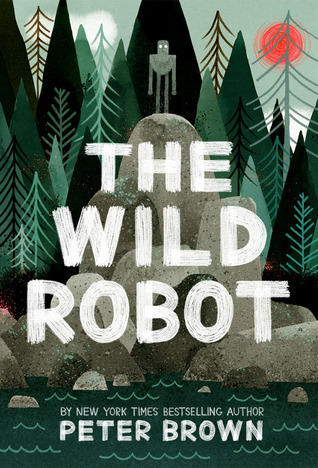 The Wild Robot was written and illustrated by Peter Brown and published by Little Brown and Company in 2016. I haven’t read a middle grade book with talking animals for a while, and I enjoyed this one. I was so interested in finding out what would happen to Roz, I read it very fast. But I’d read it again to again to study the illustrations more closely and absorb all the layers of meaning. I enjoyed the details of the natural setting and animal behavior, as well as Roz’s understandings and communications about it. By the time I got to the end, I really wanted to find out what happens next. I hope there is a sequel! It’s interesting to think about how Peter Brown managed to create a robot with warmth and kindness, while still keeping her robot-like characteristics and personality. I especially liked how the lessons and strategies the robot tried to learn were emphasized throughout the story. Peter Brown is an author and illustrator living in Brooklyn, NY. He has written and illustrated many picture books, such as My Teacher is a Monster, Mr. Tiger Goes Wild, Will You Be My Friend? and Children Make Terrible Pets. He also illustrated one of my favorites, Creepy Carrots. The Wild Robot is his first middle grade novel. Peter Brown's blog post on how The Wild Robot developed is fascinating. He explains many considerations he had while planning, such as deciding on the gender of the robot, the setting, and where the initial idea came from. I was especially interested in how long it took for this story to develop – eight years! Looking for more middle grade reads? Check out the list of Marvelous Middle Grade Monday books over at author Shannon Messenger's blog. At first this book seems like just another funny story (and it is) but there are also deeper layers and an important but subtle message about standing up for yourself and the people you love. 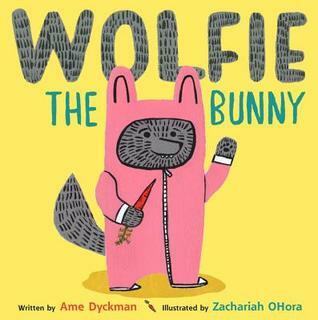 Wolfie the Bunny was written by Ame Dyckman and illustrated by Zachariah OHora. It was published in2015 by Little Brown and Company. This is a really great example of how illustrations work with the text to add more humor and layers to the story. The bright, bold illustration style without much background keeps the focus on the characters. I really liked the use of repetition. A pattern is set up that seems like it’s going to be predictable but then there's a surprising twist. There are a lot of possibilities for discussion with this book – how it might feel to have a new sibling, why the baby is getting so much attention, adoption, looking different than other people in your family, standing up for others. I really liked the idea that you can stand up for yourself and others, regardless of size. Draw your favorite page in the story. Explain why you liked it. Make puppets and retell the story! This would be a really fun book to place at a retelling centre or to use in a retelling basket. I've enjoyed two of Karen Rivers' other middle grades, so I was looking forward to reading this one. I wasn't disappointed - there's lots of suspense! 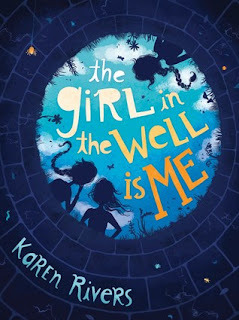 The Girl in the Well is Me was written by Karen Rivers and published by Cormorant Books in 2016. I really didn’t like the girls in this book, reminding me of “mean girls” I encountered myself at various times in my life so far. I liked the way more layers of Kammie’s personality and history were revealed as the story continued, and I was scared for what might happen to her. It’s a good thing this was a shorter book that I could read fairly quickly. I found it interesting to think about how the author created tension and suspense while writing in a stream of consciousness style. A really good example of writing where everything is written in the thoughts of the main character, and realistic in the way her thoughts jump from one idea to another related idea. Karen Rivers (www.karenrivers.com) is the author of 18 novels for adults, young adults and middle grade readers. Her middle grades include: Finding Ruby Starling, The Encyclopedia of Me and Waiting to Dive.